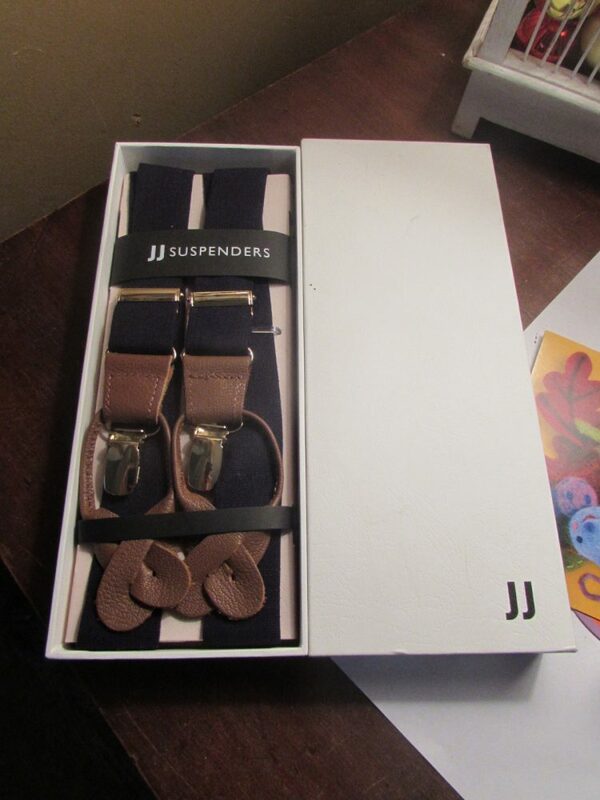 We received the mentioned product for review by JJ Suspenders. The thoughts contained within this post are ours and may vary from the thoughts of others. Timeless, versatile and dapper—that’s how we describe these suspenders. Boasting a navy, cream, caramel and goldtone color palette, this menswear accessory will polish your every special-occasion get-up. Soft blended fabrics cut at the perfect width ensures a modern look perfect for casual or formal wear. Pair them with slacks and a blazer or keep it casual with chinos and a button-up. JJ suspenders are designed for heights between 5’2 and 6’2. If they don’t fit perfectly – return them within 15 days for a full refund. Growing up every single time I saw my Grandfather he always had on suspenders. He had work ones and he had dress ones. I always thought they were so unique because I never saw my Dad wearing them but always Granddad. This Thanksgiving was our first without him and this review opportunity hit home with me. Opening the box to take photos of these suspenders I immediately knew that they were high quality. The box is perfect for gift wrapping this holiday season, but also it is high quality for storing your new treasured suspenders. I also love the quality of the material used for these. There is a kit under the suspenders with thread, clips and buttons so that these can literally be worn with any outfit. The memories that flooded back even looking at these made me smile, but also made me really miss my Granddad. My husband is not much of a suspenders wearing kinda guy, but we will be gifting these to a family friend this holiday season and I know these will be loved for many years to come because the quality of the material is top notch! Retailing for $109 the Classic Navy Suspenders are the absolute perfect gift for any dapper man that you may know. I love the vintage feel of these while they are also very very contemporary at the same time. Timeless clothing pieces make the best gift for even the most hard to shop for man, so we give JJ Suspenders 2 thumbs up and will be adding this review to our 2017 Holiday Gift Guide where you can find the best of the best gifts for everyone on your shopping list including even our furry friends!